VANCOUVER, Oct. 10, 2017 /CNW/ - Hannan Metals Limited ("Hannan" or the "Company") (TSX.V: HAN) (OTCPK: HANNF) is pleased to announce new soil geochemical sampling results that has identified a large and coherent anomaly up-dip from the mineral resource area at the 100%-owned Kilbricken zinc-lead-silver deposit in County Clare, Ireland. 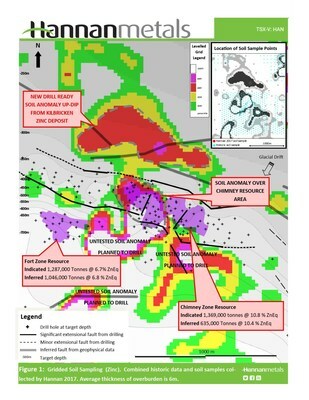 The geological context of the soil anomaly makes it a high priority target for immediate drill testing (see Figure 1 below). The maiden mineral resource, dated July 10, 2017, immediately ranked Kilbricken as one of the top ten base metal deposits discovered in Ireland by tonnes and grade. Total indicated mineral resources were calculated as 2.7 million tonnes at 8.8% zinc equivalent ("ZnEq"), including 1.4 million tonnes at 10.8% Zneq and total inferred mineral resources of 1.7 million tonnes at 8.2% ZnEq, including 0.6 million tonnes at 10.4% ZnEq.